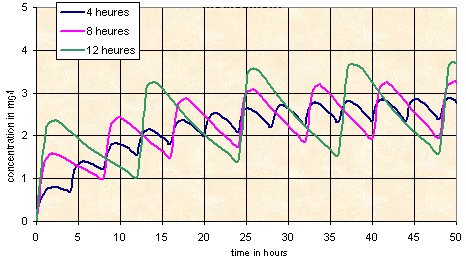 Plasma concentration-time curves after repeated administrations by oral route of a drug taken at the same daily dose divided in 2, every 12h, 3, every 8h and 6 intakes, every 6 h.
When a drug is taken at the same daily dose, the number of intakes do not change the mean plasma concentration nor the time for reaching the steady-state concentration. The number of administrations changes the heights of peaks and troughs around the mean value and the differences between them. When the frequency of administrations is diminished (interval between intakes increases), peaks are higher because the dose is increased and troughs lower because the interval is lengthened and inversely.